AS Monaco have announced that they’ve suspended Thierry Henry from his managerial duties until further notice. The Arsenal and France legend was appointed the manager of his boyhood club in October following Leonardo Jardim’s dismissal. At the time of Henry’s appointment, Monaco were down in 18th-place in Ligue 1 with just one win in nine games and turned to their former player in a desperate bid to turn things around. But Henry has fared no better than Jardim with just five wins in his 20 games in charge of Les Monégasques with 11 of those ending in defeat. Therefore, Monaco remain in the drop zone in 19th-place and three points away from safety and two from a relegation playoff spot. Following a humiliating 5-1 home defeat at the Stade Louis II to Strasbourg, Monaco’s season’s hit a new low on Tuesday night with another home loss at the hands of Ligue 2 side Metz in the Coupe de France. Despite Radamal Falcao equalising for Monaco, it proved to be a futile effort with Metz booking a last-16 spot by claiming a 3-1 win over the 2016/17 Ligue 1 champions. And things appear to have hit a boiling point recently for Henry after he was made to apologise for insulting Strasbourg defender Kenny Lala last weekend. The 41-year-old was caught on television cameras yelling abusive language at Lala during a throw-in for Strasbourg in the league game. 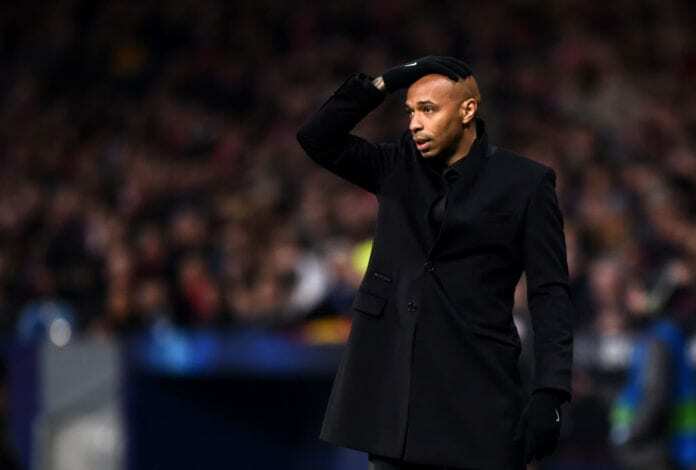 Now Monaco have decided to suspend Henry until they have made a final decision on his future at the club. “AS Monaco announces that we have decided to suspend first-team coach Thierry Henry,” read a statement on the club website. Franck Passi, who was Henry’s assistant coach at Monaco prior to his suspension, will now be preparing the club for their next game away to Dijon FCO in the Ligue 1 on Saturday. The 52-year-old had previous spells in charge of Marseille and Lille OSC on a caretaker basis in the past.